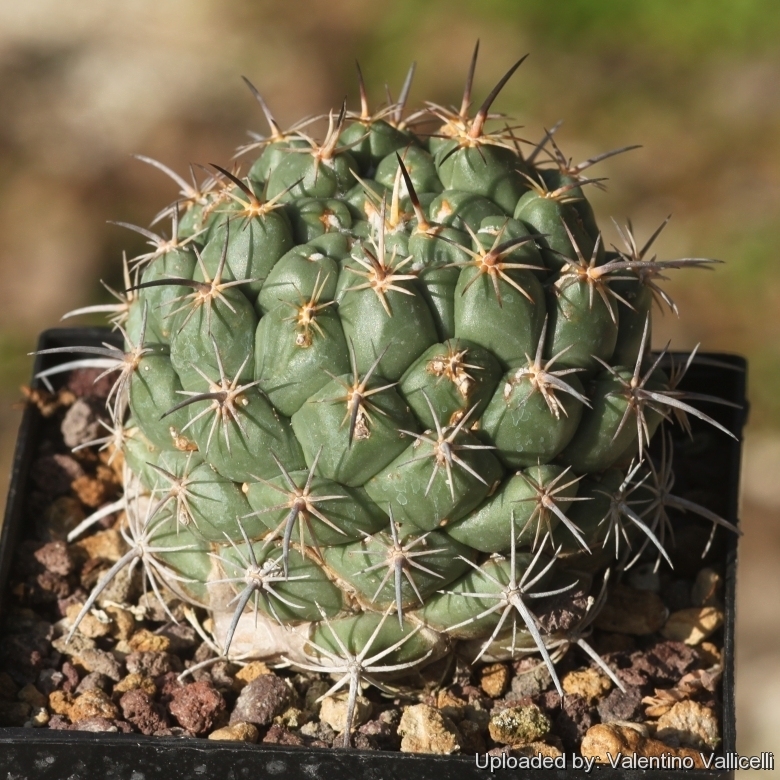 Description: Coryphantha longicornis is a large growing and solitary or group forming cactus with woolly stem tips. Stem: Fat squat globose to short cylindrical glossy green or dull green, up to more than 9-20(-30) cm high and 10-15 cm broad. Tubercles: Spirally arranged, conical/ovate, more or less erect, very firm, 14–17 mm wide up to 2 cm long with a narrow, bare groove above; on new growth the groove may show some felt. Axil bare or slightly woolly with one gland. Central spines: 3, rigid, stiff, white to brown, often with black tips, about 1.2-2,5 cm long. The lower one is curved and descending, while the upper and lateral ones are shorter. Radial spines: About 12, translucent whitish, acicular, acicular, equal straight or curved, short, gray at tips , 5-15 mm long. Flowers: Diurnal pure yellow, funnel shaped, 3 to 6,5 cm diameter. Fruits: Yellow green 15-20 mm long, juicy with attached flower remnants. Coryphantha grandis L.Bremer: has shorter central spines and larger stems with more spiral ribs. Distribution: valley of the Rio Nazas stretching east from El Palmito, Durango, Mexico. Coryphantha longicornis Boed. : has 1-3 central spines, rigid, stiff, white to brown, often with black tips, about 1.2-2,5 cm long, and about 12 radial spines. Distribution: Durango - Mexico. Notes: This is a variable species especially regarding the length of the lower central spine. The plants with shorter central spines are sometime referred as Coryphantha grandis, while those with longer centrals are referred as Coryphantha longicornis. (But this classification is arbitrary and intermediate form are commonly found either in habitat and in cultivation). Cultivation and Propagation: In culture it is without problems, and regularly shows its large yellow flowers. It does best in slight shade, but does well in full sun too. It is sensitive to overwatering (rot prone), and needs a very porous soil with good drainage. It flowers quite early, but needs about 8-12 years to reach the typical, definite outlook. It tolerates fairly low temperatures as long as it is kept dry (hardy to -5° C or less for short periods of time).